Galloping Grace Youth Ranch is donated 300 pounds of pork to the Roadrunner Food Bank in May. With this meat donation from the Ranch, the Food Bank will provide approximately 250 meals for people experiencing hunger in the community. This was the first donation received by Roadrunner Food Bank from Galloping Grace Youth Ranch and is part of an ongoing partnership between the nonprofit organizations. Over the next year, the Ranch estimates it will donate 2,250 pounds to the Food Bank, which represents roughly 1,875 meals to be distributed. The Food Bank composts food no longer suitable for human consumption and will supply the Ranch with this composted product to feed its livestock. Galloping Grace educates children about farming and sustainable practices through experiences growing crops and raising animals on a working ranch. The Ranch will continue donating fresh meat, eggs and produce to the Food Bank, which will be distributed throughout the state to people who need help with food. The pork donation is an example of Galloping Grace’s Community Supported Agriculture (CSA) program. 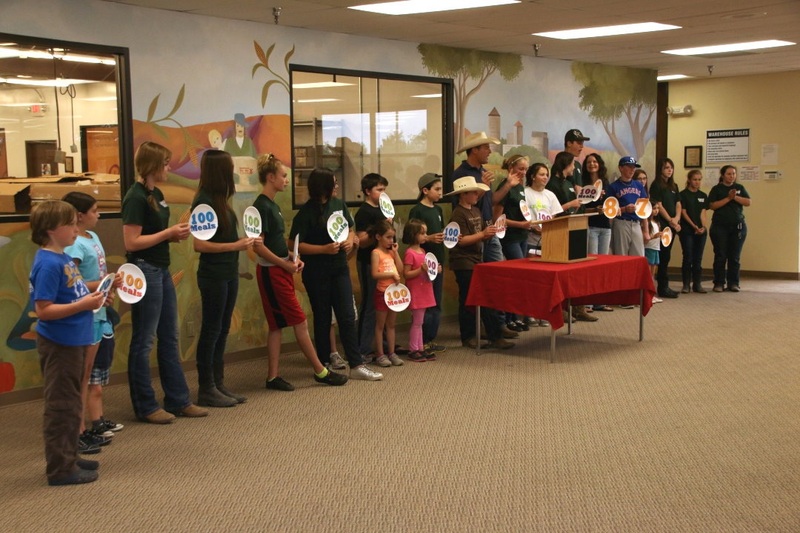 CSA is a way for consumers to support the farmers and ranchers that serve their local area. Consumers provide monthly financial support for the farm’s agricultural efforts, and in exchange, they will receive shares of the meat, eggs, milk and produce grown on the Ranch. To become a CSA program member, sign up online at www.ggyr.org. Supporters are given a choice of six different contribution levels, ranging from $5 to $225 per month. For more information on Galloping Grace Youth Ranch and its CSA program, please visit www.ggyr.org. To learn more about hunger in New Mexico and Roadrunner Food Bank’s programs and services, please visit www.rrfb.org. Galloping Grace Youth Ranch is a place where kids lead kids while learning about leadership, how to raise animals, grow crops, explore the outdoors and enrich the community. In all that we do, we focus on providing a joyful experience while cultivating, empowering and educating children. We provide these children and their families with a free and unique opportunity to interact with a local, sustainable farm/ranch, which focuses its efforts on enhancing agricultural education, improving the environment and encouraging charitable giving in our community. We believe that by cultivating healthy children today, they will harvest a healthy society tomorrow. For more information on Galloping Grace Youth Ranch, please visit our website at www.ggyr.org. New Mexico is ranked as one of the hungriest and most poverty stricken states in the nation. Roadrunner® Food Bank, a Feeding America member, is the largest non-profit dedicated to solving hunger in New Mexico and operates locations in Albuquerque and Las Cruces. Last year, the Food Bank distributed more than 26 million pounds of food through its own programs, a statewide network of partner agencies, and regional food banks helping nearly 40,000 children, seniors and adults weekly. Roadrunner Food Bank kept 22 million pounds of food out of landfills last year through its Food Rescue Program. For more information on solving hunger in New Mexico, visit www.rrfb.org, or follow us on social media at: www.facebook.com/roadrunner.food.bank, www.twitter.com/roadrunnerfdbnk or www.rrfb.org/blog.